Not that this will be comfort for most, but I showed this to my dad, alongside the 2016 Kraehe that sits in the top tier of Powell & Son wines (alongside a couple of the other releases). His words were things like ‘remarkable’, ‘extraordinary balance’, ‘stunning’. Ok. He’s no wine critic, but his due diligence with wine, solid interest and research, and long history drinking the stuff, plus enjoying finishing off my fancy samples, gives him some small authority. Plus he saw a few of the Powell’s wines not only this year, but last. Psuedo-review aside, this was a striking thing to watch and enjoy in glass over a days. The vineyard is 130 years old. The Dominque Laurent barrels season the wine six months less than the Kraehe, though Laurent barrels are meant to be partly ‘magic’ for their seamless oak integration anyway. Powerful fruit character is the charge. Dream vintage. The build up in this intro comes to this… alongside Standish in full flight, this is one of the best young Barossa wines I have ever seen. Or any Barossa wine. I wanted to stay head above water on such a conversation, especially considering hype and price, but the wine drowned me anyway. I’ll drop the chat in about the light malty character in the oak profile first, because that’s where the points go missing in this wine. To build up the wine, it’s completely seamless, rich but lively, coursing with complex, layered red and dark berry fruit character in bouquet and palate, fruit sweetness is a forte, but so is earth, brambly herbal-savouriness, an exotic spice character, the notable dusting of white pepper, the faint but shapely chew of coils of tannin, the freshness that lifts the wine and draws it long. Beauty comes despite the muscular feel of the wine, and that lifted perfume, Eden Valley flight and guile, the faint coolness and restraint, are just so damn beguiling and delicious. Amazing wine. From vines that date back almost 120 years, from a site in Seppeltsfield, Barossa Valley. The wine matures in barriques. As with the motif of Powell & Son wines, this is no shy and retiring type, nor one that sits in the spectrum of prettiness and ‘South Australia’s answer to pinot noir’ sometimes bandied about by, well, South Australians. 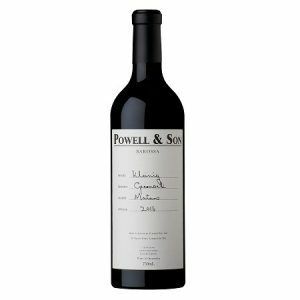 The vines are handled by the Powell father-son duo, and they’re moving forward organically in farming practice (across all sites they manage themselves). Quite the perfect storm, you could say. Powerful grenache of slick texture, lavish fragrance, opulent feel and ripe fruit-sweet spice. It opens with a light, young port note, quickly whipped away on rose water, cinnamon spice, dried cranberry and raspberry jelly scents. The palate is oily, rich, buoyed with ripe berry fruit flavours, touched with licks of that pleasing medicinal tang of maraschino cherries, finishes epically long, sweet and surprisingly light. It rolls with generosity, concentration, density, but holds a freshness underlying that tips drinkability into the conversation early. A unique specimen for grenache, in some respects, where muscular heft meets some sense of elegance. From a single vineyard in Greenock, and from vines planted from what is considered to be one of the original mataro clones in Australia, ‘Kleinig’. Two barriques produced only of this wine. It certainly is a heartier expression of mataro, and indeed, fared much better for judgement on day two. First day open the wine was elbows and knees, and quite aggressive, even. Day two presented a much more fine-tuned wine, though it’s force and impact is not lost. Big, bold mataro. A fog of dark berries, glace cherry, turned earth, brambles and undergrowth with a strong mahogany/cedar wood character through and through. The palate is dense, thick set, pulsing with brooding dark berry and plummy fruit, salted liquorice like character and flecks of oak, spice, earthiness in tow. It pushes through in full flight right to its lingering, sweet-fruited and sweet-spice, palate staining flavours. No wall-flower. Texture feels slightly gritty, but in a good way, though silkiness settles into the wine on day two. Quite something. This is the only single vineyard wine that we don’t manage the vineyard from the start. Marcus Schulz is a 5th generation grower with vineyards in the Koonunga Hill and Ebenezer districts in the Northern Barossa. He’s into his 70’s now, has over 100 acres of vineyard that he manages biodynamically. Dad’s first wines in 1994 were made from Marcus’s fruit (pressed the same day I was born, funnily enough. Choosing between the winery and the hospital you can guess where he decided to go first). Dad (and so I) have learned most of what we know about growing grapes from Marcus so we thought that it was fitting to name a wine after him. Also this year was the 25th consecutive vintage that we’ve taken fruit from him. Magic stuff. A hearty wine from Koonunga Hill. Wonder if Penfolds have the jitters seeing Koonunga Hill on the bottle here. Lusty serve of dark berries, sour plum jam, cedary notes, choc-cherry. It’s hearty, rich scents of fruit and spice. Texture is plush, velvety, long. Indeed, tannins stick gummy and chewy in the palate well after each sip. Density is a thing here too, yet freshness is inherent, almost inexplicable, but wonderful to refresh the palate after each hearty sip. Balance is great here, flavours lip-smacking and generous. Like them bold, with some currency (heritage, site, quality winemaking, et al) then this is a done deal. Loechel Vineyard, Eden Valley, and the steeper, highest part of the vineyard. Lots of new oak here, matured for 18 months. Fruit seems to marry pretty well with the wood, though it is in a style, so to speak. Malt-choc scents, red raspberry lollies, sweet earth and a swathe of woody spice scents. Attractive start. Slick and silky in the palate, lifted fruit sweetness and then the chew and drag of puckering, smooth woody tannins. Very concentrated flavours but an almost binary floral, lifted feel to the wine. A bit head-spinning in a way. Has the beauty of Eden with the heft of somewhere lower to the ground and warmer. Quite compelling in its way, but you’ll have to like the strong presence of oak, albeit well married. It’s mostly grenache with the remainder equal parts shiraz and mataro, old (117-years) and young vines. The wine hangs out in 2500 litre foudre. 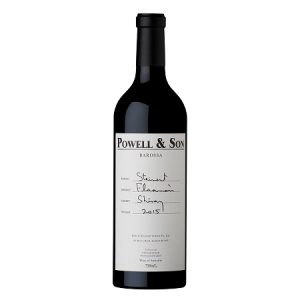 Large format oak a motif for Powell & Sons, though vineyards seem to be the real calling cards. And a shift to organic farming. Potent conversations. Rich perfume of dark berries, ripe plums, tobacco, flint and undergrowth. It’s part way between flirty fragrance and guttural grunt. Smooth and rich to taste but set to medium weight. Sweet-and-ripe berry and plummy flavours, a touch of espresso to supple tannins, good length of flavour, some molten dark chocolate character way down the long, sticky finish. Even, slippery, moreish kind of red. A combo of of 70-year-old vineyard and 50-year-old vineyard, Barossa and Eden, with the fruit matured for 15 months in 4500 litre foudre. It’s no wallflower here. Phew. Alcohol is modest, the punchy flavour is where the action is. Strong red of muscular, dark berry fruit character, palate staining flavours, serious ripple of tannin. Opens with ripe berry and plum fruits, nougat, sweet spice, malt and dark chocolate. Similar things layer complexity into the fruit core of the palate, a wall of thundering red, deep, dark and yet, curiously smooth as, though there’s some nice gritty chew to tannins in lingering mouthfuls. Serious stuff. You judge a Thai restaurant by its Pad Thai and a Barossa Valley producer by their entry level shiraz. Rules for life. This wine comes from Kraehe vineyard in Marananga. As young Callum Powell tells me, it spends its life post-harvest in a 4500 litre foudre, for 15 months. A serious approach to the ground floor. Has that high drinkability yet generosity going on. Lavish spice, sweet-ripe forest berry fruit characters, raspberry liquorice straps, salt bush and pepper seasoning. Lush texture, slippery, smooth as can be, almost Porter-like in a way, finishes long and rippling with sweet fruit and spice. A touch of tartness to acidity on exit is the only quibble. That being said, a pearler of a Barossa shiraz here. The past saw marsanne in some new oak, the roussanne not, and the wine a feat of blending rather than co-fermenting. Layering in the detail. The total new oak is 20% but you’d hardly know aside some textural elements that might trigger something in you. It feels like a fine wine from the get-go, is the other message. Slippery texture, a touch of gras with cool melon and ripe apple scents and flavours the mainstays. It shows sniffs and licks of nougat-halva too, a well-rolled-in seasoning of oak and lees time. Length is excellent, the wine feels like it stains the palate but finds some velocity to tighten up and go lightly-nutty-bitter to close, way-way away. Medium weight white of high interest and drinkability, is the takeaway. Always a suite of wines I look forward to… Powell & Sons going sort of quietly about their business, focussing on older vines, good sites, expressions that speak of Barossa Heartland. This is off a quartz-riddled vineyard in Flaxman’s of the Eden Valley, which seems to be a bit of a theme from vineyards/wines I like from that parish (think Ruggabellus too). The vines are 90-years-old or so. Beautiful riesling, arrow shaped, lively with fruit-floral characters, strong sense of ‘minerality’ and a finish that trails off and then puckers up with light talc-like chalkiness. It’s precise, energetic, fine-boned yet packed with lip-smacking limey flavours. Refreshing and complex at once. The best release of this wine yet.